Marriott Greater China Business Councils and its Junior Business Council (JBC) recently held the Marriott Millennial Speech Contest finals themed "I am a Hotelier" at Renaissance Beijing Capital Hotel. Charlie Fan from Sheraton Sanya Resort beat 11 other finalists to win first prize. 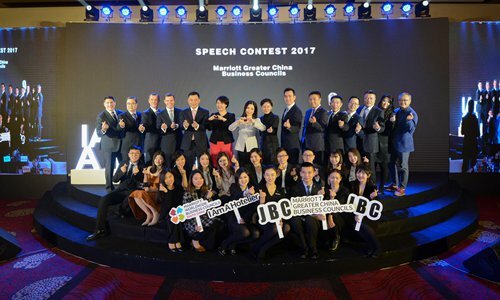 "The speech contest aimed to arouse pride in millennial hoteliers, give them a voice and help them cultivate a professional mindset," said Angela Pan, guidance team member of Marriott Greater China Business Councils. She said the Councils created JBC to develop future leaders by providing mentoring opportunities to rising stars and injecting creativity in the hospitality industry.